​Mandalas, those intricate, circular designs that seem to be popping up everywhere these days, are a gorgeous symbol of an interconnected universe. Some people love them because of the spiritual sense of togetherness they represent, or the mindful practice it takes to carefully draw one. Others just appreciate the beauty they bestow on any object. No matter what it is about mandalas that appeals to you, these DIY mandala crafts will inspire you to start drawing, painting, or stamping your own unique designs. ​If you’re just starting out with making Mandalas, this tutorial will help you practice the basic methods and create a cute ink drawing. Use it as a handmade notecard, a piece of art, or to create adult coloring pages with big shapes and bold lines. ​Once you’ve mastered the basic circular drawing techniques for a Mandala, or even if you’ve just had a lot of practice doodling in class, you’re ready for a more refined project. Follow this tutorial to create a large, black and white ink mandala drawing that incorporates floral elements. Because the video breaks down the complex design into smaller, easy to sketch items, it’s easy to get an impressive result in just a short amount of time. ​While most mandalas are drawn in black or colored ink on a white background, this project flips tradition on its head to create a striking white design that pops on the black background. Follow these steps to make a lightweight DIY mandala art piece that can be finished in an hour and hung almost anywhere you want to create a dramatic visual. For more decorating ideas you can also check out these easy DIY dreamcatcher tutorials. ​Mandalas look great everywhere, so follow this tutorial to brighten up your garden or desk. This project can be as quick as a few minutes to complete one stone, or you can spend hours designing a whole path of rainbow rocks. Leave your creations in out of the way spots around town to brighten someone’s day and spread the good vibes. ​One of the versatile aspects of DIY mandala art is that you can add the black and white designs on top of other patterns or textures. 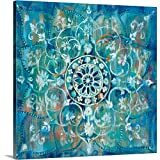 This project starts with an abstract painting on canvas and then uses simple concentric circles to guide the intricate, floral mandala. Plan for some drying time for the original canvas before you start adding the mandala, but this art can be created in a single afternoon. 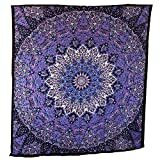 ​If you appreciate precision and symmetrical patterns, or simply love DIY mandalas but aren’t confident in your ability to hand draw the design, the tutorial below uses a tracing technique that lets you design a small section of the mandala and then transfer a pencil pattern onto the rest of the square art in an easy and exact way. Once you have the perfectly symmetrical pencil version, just trace and color with ink. ​Mandalas are so beautiful you will want to show yours off. Take your hand drawn design on the go and put it to good use in this functional notebook. You can customize it with any color or size paper you like or even use scrap paper to reduce waste in a pretty, practical way. This tutorial estimates you’ll take about ten minutes to draw a fairly basic mandala, but creating the notebook can take as much or as little time as you want! ​A fun way to bring mandala zen to your phone is to create a phone case with a henna-inspired design. The steps in this tutorial show you how to use a clear phone case to trace a design using any color of paint you love and then protect it with a clear acrylic coat. Including drying time, you could be showing off your new phone in an hour. ​If you love the look of ink mandala pillows but hate the price tag check out this tutorial that walks you through some easy steps on how to use stamps to create a crisp DIY mandala pattern on any cloth with only a few affordable supplies. Make a whole set of pillows using different patterns or swap out your ink color. ​The same tutorial as above also presents how to make your own T-shirt with a mandala design. You can use different block patterns or different colors to make a tee shirt that matches your personality. No drawing talent is needed, but you will want a flat surface to work on where you can leave your fabric undisturbed while it dries. ​DIY Mandalas don’t have to be limited to ink: you can create the same floral, concentric pattern using tie-dye techniques. This could work with any fabric, but a sheet works well when you use the steps from this tutorial. A large amount of fabric lets you create wedge-shaped folds and then add rubber bands that leave enough space for each of the rainbow colors to dye the fabric without running together. The technique isn’t hard, but you’ll need a fair amount of space to spread everything out, and this project is messy, so take that into account before starting. ​Creating a DIY mandala takes focus, whether that means ten minutes or several hours. A hand-drawn design doesn’t have to be perfect to be pretty, and the relaxing process of creation itself can be just as important and enjoyable as the final project. No matter which DIY mandala you choose, slow down just a little to connect with your art and your time.